75 year old Boubacar Traore has been playing his blues-inflected music since Mali gained its independent in 1960. Unbelievably, he didn’t make a recording until 1990, but he was there (and popular) before Ali Farka Toure, Tinariwen and the desert blues boom. 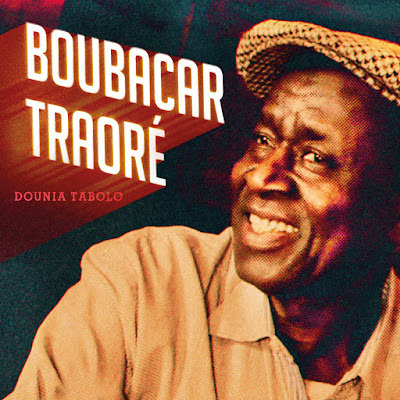 On his tenth album Traore is joined by a well-curated group of guest stars: his frequent collaborator, harmonica player Vincent Bucher; singer-cellist Leyla McCalla, formerly of the Carolina Chocolate Drops; fiddler Cedric Watson (ex-Pine Leaf Boys); and Richmond’s own Corey Harris. It’s a fun parlor game to match up West African blues musicians with the American blues genres they most closely resemble. In Traore’s case, it’s got to be the Piedmont style familiar to Virginians – when he and Bucher get up a head of steam as on track 1, they remind me of John Cephas and Phil Wiggins. This is a long album with long songs that give the players and the groove a lot of room to stretch out. McCalla is a standout: 3 is one of the best things Traore has ever recorded, thanks in no small part to her exquisite cello playing. A terrific album, perhaps my favorite in Traore’s oeuvre. Long may he run.